This is where I'm going on Saturday night. Queen of the Sun is Taggart Siegel's soon-to-be new movie (he last directed the film The Real Dirt on Farmer John) and there's a sneak peek screening in Portland this Saturday night at 8pm at Sunnyside Methodist Church. The film has been in the works for three years and the screening honors the film's main character Gunther Hauk who's visiting Portland for it as well as some beekeeping workshops -- see details below. 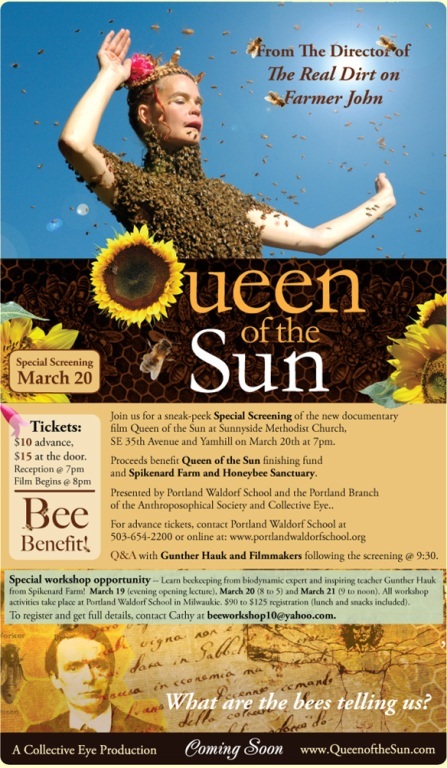 This special screening will raise money for Hauk's Spikenard Farm Honeybee Sanctuary as well as for the world premier and national release of Queen of the Sun later this year. March 19th-21st beekeeping workshop from biodynamic expert and teacher Gunther Hauk. All workshop activities will take place at Portland Waldorf School in Milwaukie. Cost: $90-$125 -- lunch and snacks included. I'm a big fan of Oregon Food Bank. 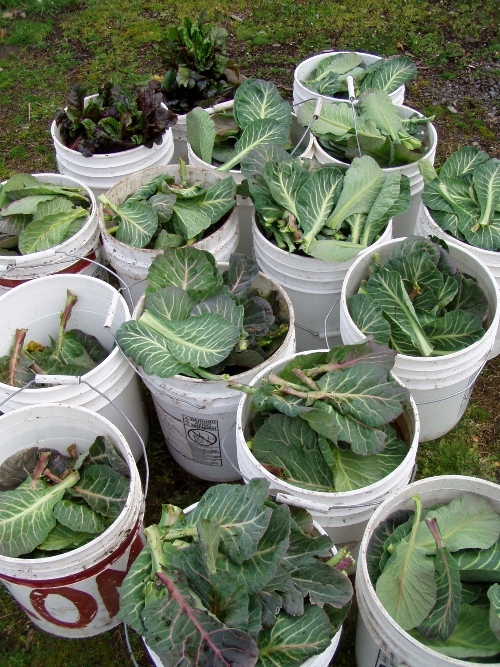 I began volunteering for Oregon Food Bank after I took the Organic Gardening Certification Program in fall of 2008. There's a volunteer component for that program and for mine I volunteered at Oregon Food Bank's Eastside Learning Garden as well as planted a row of veggies in my backyard for its Plant a Row for the Hungry program. 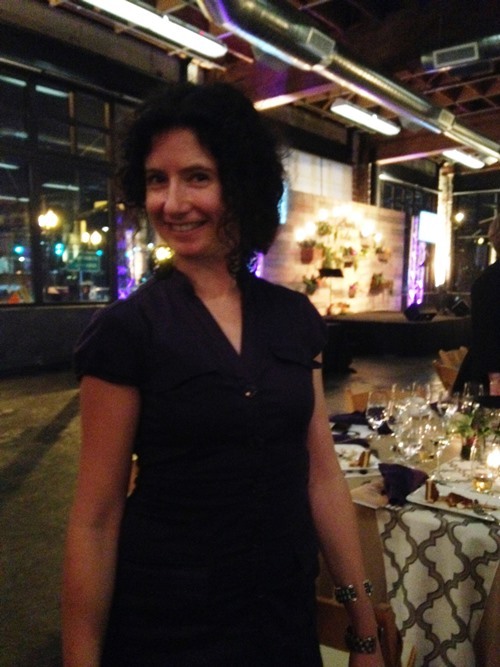 Now, thanks to Tami Parr of Pacific Northwest Cheese Project I'm participating in the annual event that Parr founded -- Blog For Food! -- a big, beautiful blog project geared toward raising money for OFB. From February 15th until March 15th Oregon bloggers are blogging it up in an effort to raise dough for OFB. The reality is that the economy has tanked over the past few months. That's not news. And as I'm sure you're already aware, joblessness is increasing rapidly. Unemployment rates all over the country are skyrocketing. What that means is that there are a lot of people in need...the Oregon Food Bank set a record for food distribution in 2008-09; according to CEO Rachel Bristol, OFB distributed more food last year than it ever has in its history. That's pretty incredible. (see the full news release here). If you're able to donate go here and/or click the link on the logo at the top of this post. When donating be sure to add the note "blog for food" in the "In Honor of" section on the Food Bank donation page, so that the totals can be tracked. If you're a blogger and want to participate head here. A friend's wife just started a new position at Oregon Food Bank and I'm looking forward to keeping up with the organization more through her. 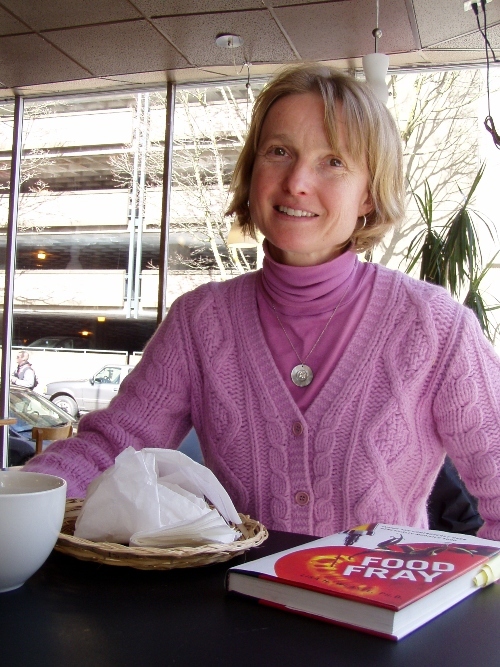 A little trivia: guess where Portland Farmers Market executive director Ann Forsthoefel first worked when she moved to Portland? You got it -- Oregon Food Bank. The containers might be small but the flavor and heat is fierce. I've never had huge success growing chiles. 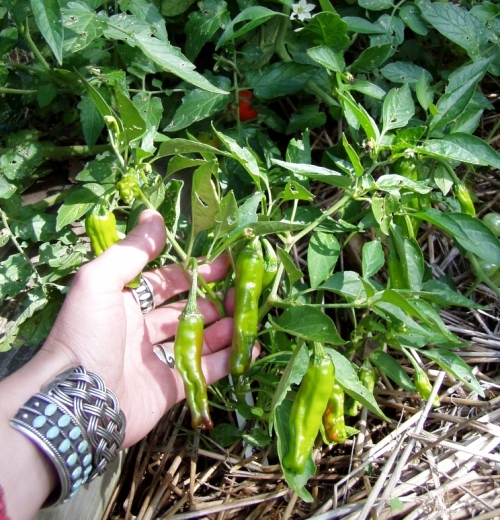 And although the Pacific Northwest isn't exactly the best place to grow them I often see friends and neighbors' chile plants often grow two, three and four times the size of mine. I know that our yard isn't the best spot in Portland to grow chiles since the arc of the summer sun is so often interrupted but I keep trying anyway. 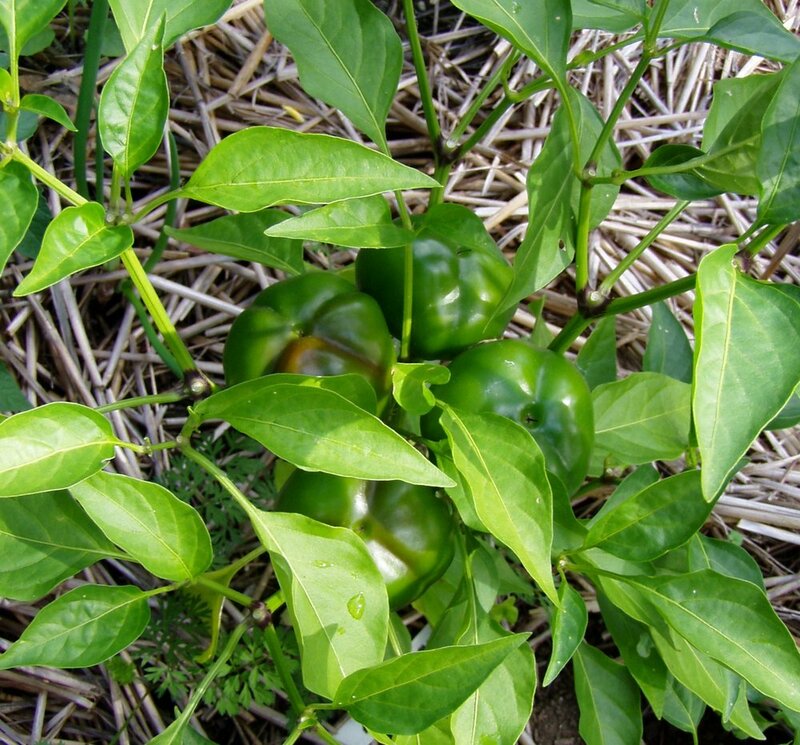 Heat is a big factor and some people in cooler climes surround their chiles with heat holding stones or cover the surrounding soil in black landscape plastic to keep the soil temperature up. I've thought of doing both but never have. Just like bay leaves -- don't forget to remove the habaneros before serving like I did. Anthony and Deb's habanero, cayenne and tomato powder. This year Anthony even gave me a bunch of rare chile seeds and starts -- most of which he got here. I did my best with them and although none took off like theirs I've been making all kinds of tasty hot sauces and salsas with them as they ripen. And if I hadn't lost my copy of The Spicy Food Lover's Bible I'd be tapping into that for hot recipes too. At least I finally found my lost recipe satchel (recipes from old restaurants I've worked at, family recipes, old neighbors' recipes) which is much more important than a still in print book. 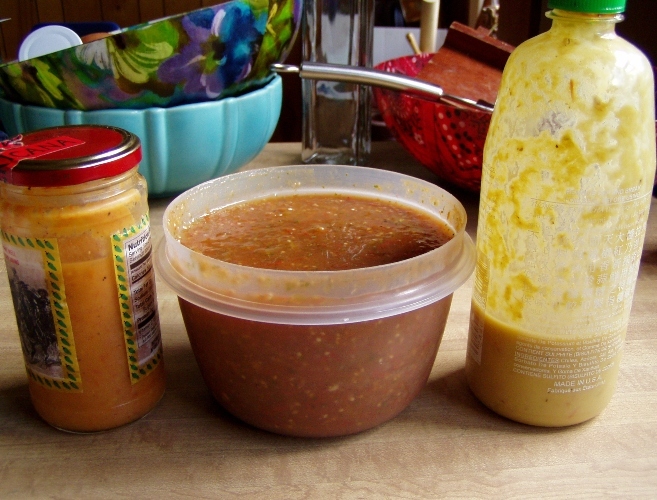 Left to right: white bullet habanero hot sauce, jamaican hot chocolate habanero salsa and kung pao chile hot sauce. Here are some shots that I took today of my front and backyard chiles. It's amazing how many colors some of them go through as they ripen. 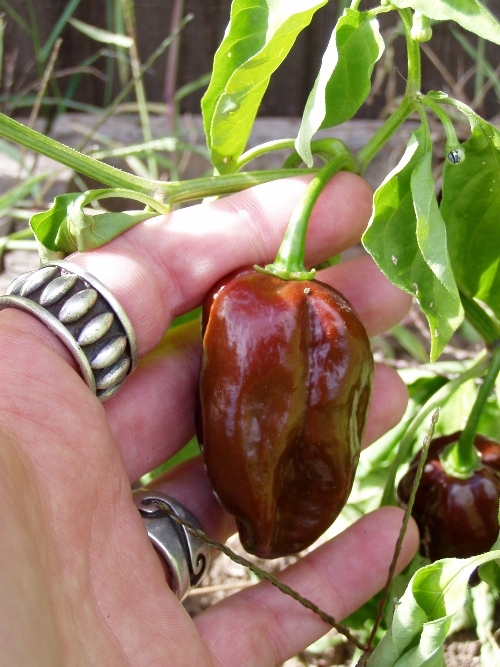 These Jamaican hot chocolate habaneros are going into hot sauce this weekend. According to my friend Anthony the best thing he ever did with Jamaican hot chocolate habeneros was sautee orange marmalade with some dried pieces of them and a little brandy for about 15 minutes. He said it was an amazing cooking glaze. Wrinkled old man chiles are sweet and flavorful. Just beginning to ripen hot cherry peppers. 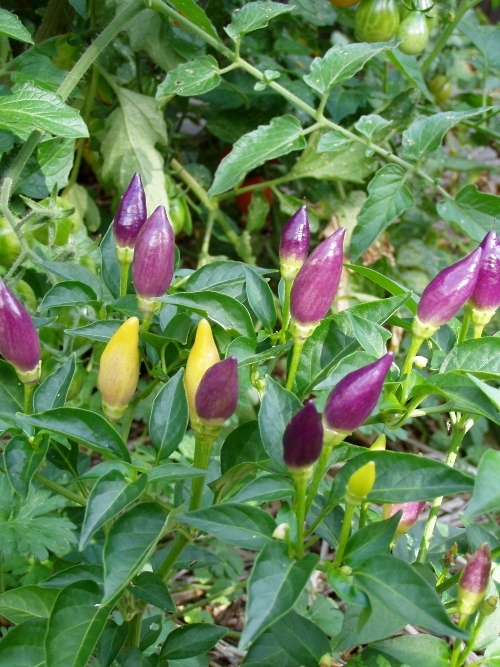 How are your chiles growing? Any great recipes? I can never have too much hot sauce or salsa but some new fiery recipes would be great. I think now's as good of a time as any to let the cat out of the bag. I have a new job working for Hawthorne Books -- my favorite Portland publishers. I've been slowly phasing in the past few weeks for an early October start date just in time to help out with two very exciting upcoming spring and summer 2010 titles. AND just in time for Wordstock -- a delicious and more food writing focused Wordstock to boot. For the two of you that don't know -- Wordstock is Portland's annual fall weekend-long literary festival with stages for all kinds of author readings, a book fair of mostly regional publishers and presses and lots of writing workshops. It takes place next weekend -- October 10th and 11th all day at the Oregon Convention Center. This year's festival includes more than a dozen food writers including The Accidental Hedonist herself Kate Hopkins; Veganomicon and Vegan with a Vengeance author Isa Chandra Moskowitz; Piper Davis and Ellen Jackson will present their hot-off-the-presses The Grand Central Baking Book; Julie Richardson and Cory Schreiber will read from their new title Rustic Fruit Desserts; and Ivy Manning will present her The Farm to Table Cookbook and The Adaptable Feast. Seasons of Change: How much should people be encouraged to eat seasonal food? Hear three authors discuss the challenges of providing a seasonal menu, the impacts of rising demand on farmers and others aspects of eating seasonally. Wordstock's Book Fair. I think this man just asked, So people still, you know, read? 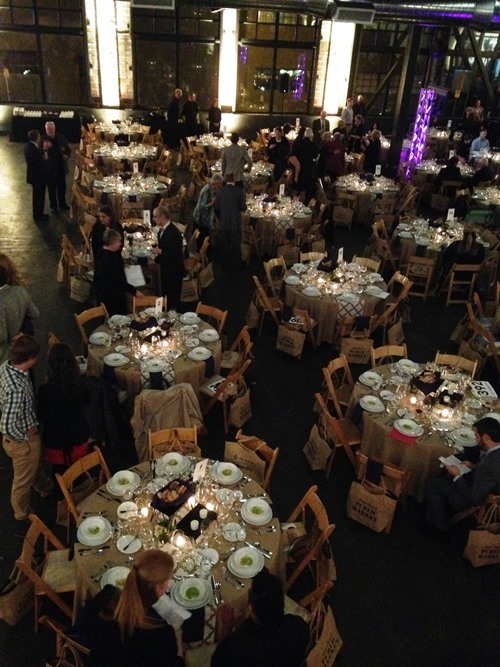 Not only does this year's Wordstock include more food writers than ever it's also promoting the new November event Livestock -- a series of Portland farm-to-fork events designed to explore the literary and literal aspects of killing our dinner. Watershed Culinary Productions in partnership with Camas Davis, food writer and founder of the soon-to-be-launched Portland Meat Collective, presents the first ever Livestock which will be held on two consecutive Wednesdays, November 4th and 11th, from 6pm to 8pm at the International Culinary School at the Art Institute of Portland. Tickets are $25 each with $10 from every ticket sold going to Friends of Family Farmers. Space is limited so please call (503) 827-6564 between 9:00am and 5:30pm to reserve your place. Pay by Visa, MasterCard, American Express or cash. Sorry no checks. Cathy Whims of Nostrana and Adam Sappington of The Country Cat will display their butchery craft as ranchers discuss their bond to the land, and writers present short stories exploring the food politics and emotions embedded in eating meat. The evenings will wrap up with a flight of beef or pork from three local farms cooked by the evening's featured chef. What: The Country Cat Dinnerhouse & Bar Chef Adam Sappington and Sweet Briar Farms, with readings & butchery demonstration. Chef Sappington will prepare three cuts from three different farms, and guests will be invited to compare and contrast flavors. When: November 4, 2009 from 6:00 p.m. - 8:00 p.m. Where: The International Culinary School at the Art Institute of Portland 34 NW 8th Ave Portland, OR 97209 (503) 228-6528 Cost: Tickets are $25 each. Please call (503) 827-6564 to reserve your seat. 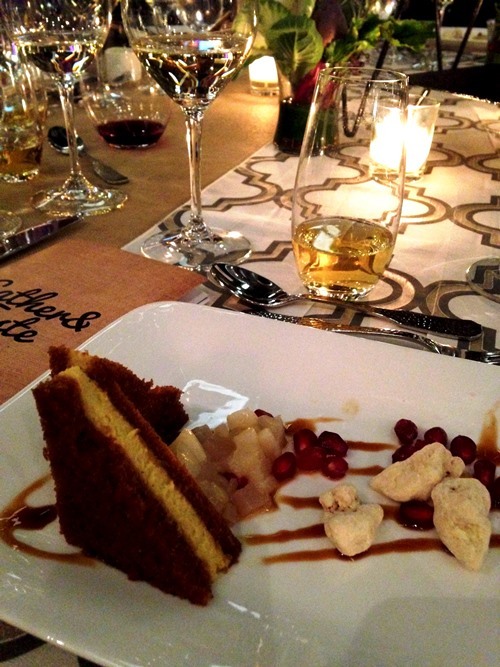 What: Nostrana Chef Cathy Whims and Laughing Stock Farm, with readings & butchery demonstration. Chef Whims will prepare a flight of meat and invite guests to compare and contrast flavors. When: November 11, 2009 from 6:00 p.m. - 8:00 p.m. Where: The International Culinary School at the Art Institute of Portland 34 NW 8th Ave Portland, OR 97209 (503) 228-6528 Cost: Tickets are $25 each. Please call (503) 827-6564 to reserve your seat. 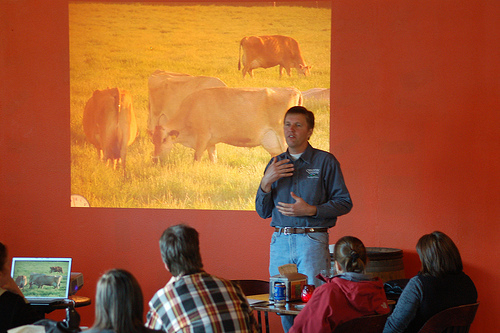 Jon Bansen of Double J Jersey in Monmouth speaks at an April InFARMation about transitioning from a conventional dairy to an organic dairy. Although you won't find InFARMation in the dictionary it's a local agricultural event that takes place every second Tuesday of the month at Roots Organic Brewery in Southeast Portland where you can eat, drink and learn about all sorts of interesting local farm issues. Since January 2009 Friends of Family Farmers has been hosting InFARMations in Roots' events space attached to the brewery. Folks arrive, order food and drink if they want (Tuesday is $2.50 brew night at Root's) and then usually by 6:30pm a farmer stands up front to talk about a pressing agricultural issue. Scot Callaway spoke at the first InFARMation I went to in mid-July. Callaway lives in Canby, Oregon and talked about how his community fought and organized against a Foster Farms CAFO setting up shop in their area. The fight isn't over. I learned a lot. Before the event I got to talk with Michele Knaus about Friends of Family Farmers and its mission. The organization was founded in 2005 by co-president Kendra Kimbirauskas and received 501(c)3 status in May of 2007. 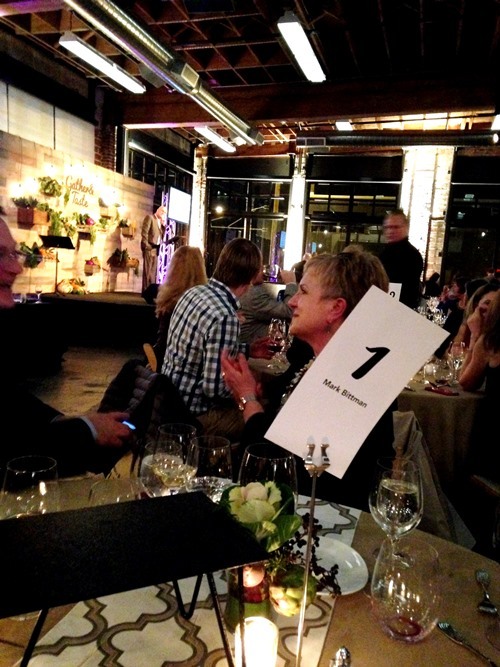 In just four years FOFF has become a leading voice for Oregon's independent family farmers. The organization provides resources to help farmers and community members resist and retaliate against factory farms and support socially responsible sustainable farming. Knaus is really happy with Portland's InFARMations. She says, "Bringing the farmers here and bringing the issues in from a different angle has been really helpful. It helps people connect with others in the community doing the same work. At an InFARMation I'll see a CSA urban farmer that I know talking to some old grizzly farmer who drove two hours to get here. I'll also see young urban people listening and taking it all in. I get really excited about that stuff." I'm a big fan of InFARMations too. In college I attended all sorts of readings and lectures from visiting professors, writers, thinkers and I'm happy to live in a city where this kind of perpetual and diverse free schooling is available -- especially in relation to farms and farmers. Added InFARMation bonuses: delicious beer, decent food and a low-key communal feel with picnic tables and an informal Q&A. The Roots space isn't a quiet auditorium where you have to climb over ten people to get out. In other words feel free to stop by or take off beginning, middle or end. According to Knaus October's InFARMation focus will be -- Eating Local: Thanksgiving, Winter, & Planning Ahead. November's InFARMation will be co-presented by the Oregon Food Bank. OFB will report on listening sessions and focus groups they've held around the state, specifically focused on food insecurity and fresh produce/farmers markets. In December Knaus hopes to get a lot of farmers in the room to talk about apprenticeships and how they're dealing with labor opportunities and training the next generation of farmers. FOFF is always looking for volunteers and donations. Check out their website for more information. 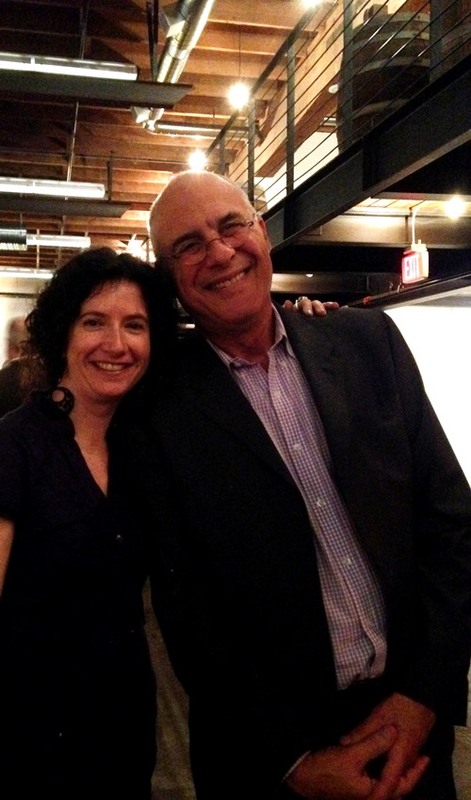 Last week I met up with Amanda Peden chair of Slow Food Portland. We met at Ecotrust so I got to have a cup of tea from Citizen Coffee which I'd been wanting to check out ever since Laughing Planet Cafe owner Richard Satnick told me about it. I showed up three hours early for my meeting with Amanda when I was supposed to be on the other side of town meeting with the folks at Nossa Familia Coffee. Lucky for me it all worked out and I blamed my calendar. Stupid calendar. Even though Slow Food Portland is the oldest Slow Food chapter in the country (it precedes the national Slow Food USA in New York) and even though I've been in Portland now for seven years I've never been to a local Slow Food event. Many have piqued my interest though especially in the past few months. Slow Food has the reputation in some parts as being a foodie wine and cheese club but it isn't in Portland and not so much in any of the worldwide chapters. The Portland chapter has 450-plus members and hosts mostly low dough and sometimes no dough events. Within the last couple years more young people have gotten involved -- half of Slow Food Portland's steering committee is now 35 years old and younger. Glen Andresen is one of many who talked at Slow Food Portland's bicycle tour of urban homesteaders this June. Music at a Slow Food Portland hosted Farmworker Housing Development Corporation tour this May. In March Slow Food Portland hosted Bryant Terry author of Vegan Soul Kitchen at the Interstate Firehouse Cultural Center for a book event and cooking demo. Slow Food Portland members pay dues that go to the national office -- $60 a year per individual, $75 per couple, $30 for students. Since the national office doesn't financially support its US chapters each one does its own fund raising. Slow Food Portland is volunteer-run. On July 21st Slow Food Portland will host another of its well attended happy hours from 5:30pm to 7pm at the North Mississippi Pastaworks. Cory Schreiber, former chef-owner of Wildwood will speak about Oregon Department of Agriculture's Farm to School program for a bit and then folks can ask questions and hang out. The happy hour is free and food and drinks can be purchased. At Slow Food Portland's last happy hour at Castagna Lisa Weasel spoke and about 70 people attended. Another big Slow Food Portland event will be on Labor Day, September 1st -- in conjunction with Portland's TBA. Have you ever been to an Eat In? Read more about it here. I've been volunteering now and again this spring at the Oregon Food Bank'sEastside Learning Garden. Along the way I've helped plant bush beans and calendula, lay garden paths, harvest collards and more. To sign up for Eastside Dig In! shifts go here and fill out a quick form. 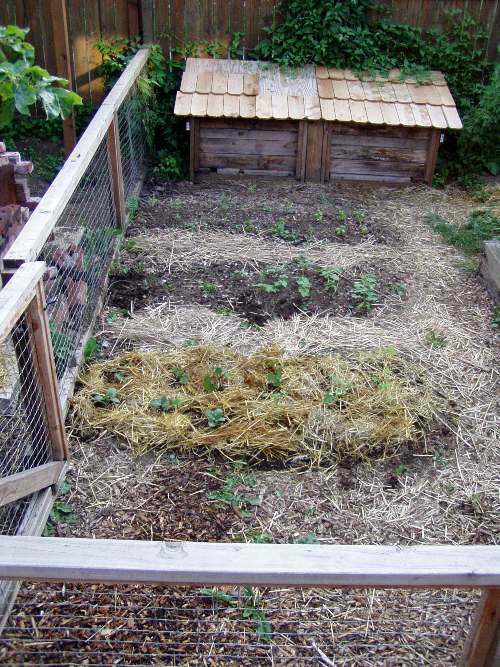 There's also an OFB Westside Learning Garden in need of volunteers. The last time I was on the OFB site I came across Plant a Row for the Hungry. The gist: plant a row of vegetables and donate all of the food it produces throughout the season to local hunger relief agencies. 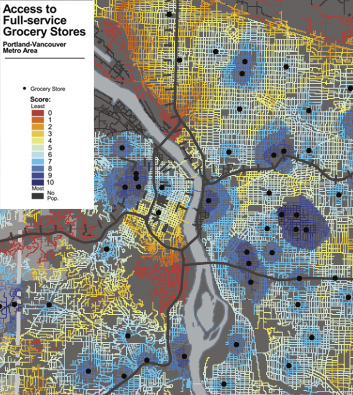 Oregon Food Bank has made this national campaign easy with various online Portland maps with Plant a Row drop-off points, contacts and times. There are three drop-off spots in North Portland close to my home so that makes it easy. I planted my Row for the Hungry this weekend -- well really my small mound -- and I think it'll be make for a nice and diverse mini harvest. I started everything from seed during the past few weeks except the eggplants which a friend gave me. Food pantries and soup kitchens need produce that stores and transports well. If you have any additional questions contact Eric Sopkin at 503-282-0555, Ext. 260, or esopkin@oregonfoodbank.org. Last fall my boyfriend and I decided to finally make good use of the apples from the ancient apple tree in our backyard. I'd heard that F.H. Steinbart Co. rented out one of their cider mill/presses every weekend in the fall for $20. I called as soon as I found out last summer when our apple tree was set with loads of good looking fruit. I thought it would probably ripen around late October just as it had the previous fall so I reserved the press for the first weekend of November. That happened to be a very busy weekend -- Wordstock, my first face-to-face with my publisher, an all-day rain garden/stormwater management class for the Organic Gardening Certification Program, and cider making 101. Two things happened that had a huge effect on the latter. First, we lost a major limb of the apple tree mid-summer, which completely obstructed the street behind our house and sent tennis-ball-looking, unripe apples all the way up and down the street. Because of that we had to do some major emergency pruning to save the tree. The next impediment to our home cidery: the slim-pickings apples that remained ripened early. Very early. Most were good to go by early September. Although apples keep well -- two months was pushing it and to be honest there just weren't that many still on the tree. 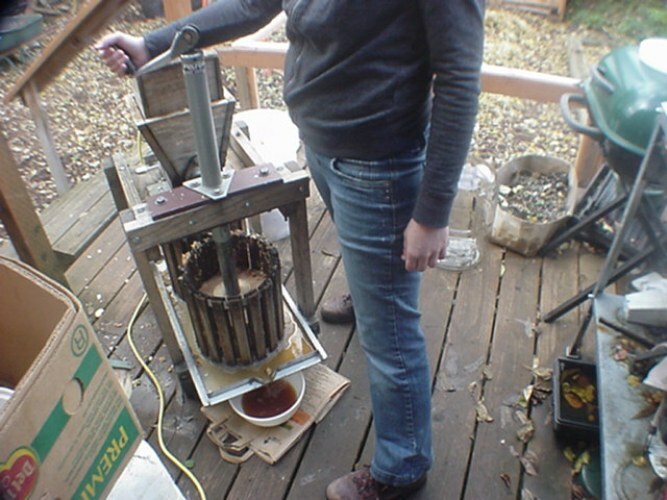 Our cider press reservation was firm, however, and no other weekends were available. I started hunting for apples. After milling we put the apple pomace (the resulting bits and chunks) into the press and then started hand cranking the juice. That took the most time. As you can see a lot of bits made it into the cider. That didn't matter because before pouring the cider into the carboy, with a packet of champagne yeast, we filtered it through cheesecloth. Apple Bits was a nickname my friend Mary Ellen gave me in grade school. If only she could see me now. 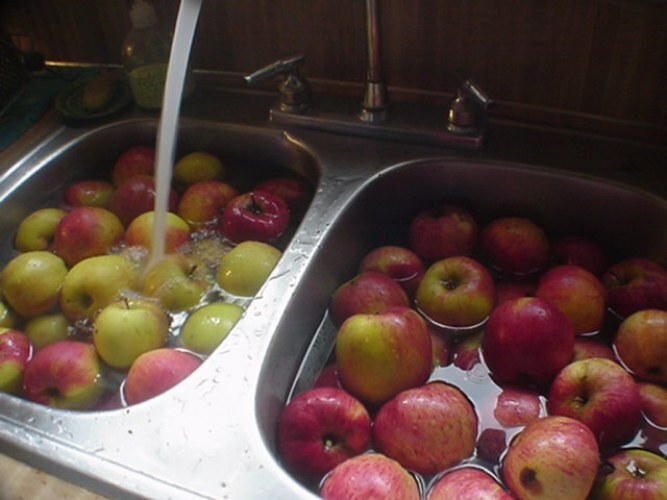 80-plus pounds of apples became a mere 3 gallons of cider. Our how-to book Cider Hard & Sweet: History, Traditions, and Making Your Own by Ben Watson for The Countryman Press doesn't suggest an apple to juice ratio but surfing around online it seems like the consensus is that roughly 15 pounds of apples usually translates to about a gallon of cider. Either we need to do some push-ups in prep. for this fall or our apples weren't exactly up-to-snuff juice wise. After all that, which took the better part of a day, we had three gallons of cider in a carboy with a purge tube stoppered to the top leading to a half-full bottle of water. This way nothing noxious or foreign could travel into the cider but if the fermentation got particularly feisty and bubbly the cider would overflow into the bottle of water. We kept it in the utility room and checked on it every few hours at first and then every few days. Once the initial fermentation was over, about a week or two I think, we removed the tubing and topped the carboy with a regular fermentation lock. Then we left the cider largely unattended until January. She's giving a free and open-to-the-public talk tonight about genetically modified food at 6:30pm at People's Food Co-op. And urge you to go. Did you know that the Willamette Valley produces roughly 90 percent of the nation's beet sugar seeds and that Monsanto wants to introduce GM sugar beets to our region? Lisa H. Weasel knows all about this and so much more concerning the biotech industry and its affects on food and food security. I really wish I could go. Anyone who does please let me know how it went.